Robert Malachy was born at Callington, Cornwall on 21 December 1828. Serjeant and member of the inaugural Ballarat School of Mines (SMB) Council. He held a position on the Council until illness forced his resignation in May 1895, and was elected a Life Governor in 1889. R.M. Serjeant was an active and generous supporter of SMB, and lectured and examined in the Principles and Practice of Mining. He was regarded as an authority on alluvial and quartz mining, and had been a member of the Ballarat Local Court and mining board. Serjeant arrived in South Australia around 1849 moving to Ballarat in 1852 where he became became famed as a mine manager. The Band of Hope and Albion Consols in Redan was founded by Robert M. Serjeant. It was Ballarat's largest alluvial mining company and continued into the quartz era becoming Ballarat's greatest mine. Quartz was worked from six shafts resulting in 158,299 ounces of gold. A further yield of 246,737 ounces resulted from alluvial mining. 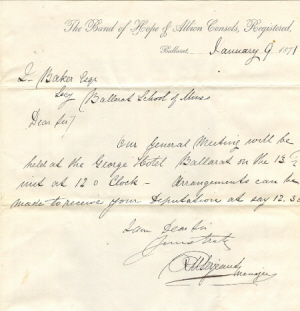 A document from around 1898 states that Serjeant 'was the general manager of the Band and Albion, and the dividend account reflects his judgement and prudence.' Yarrowee Hall, the heritage listed home of the Serjeant family, was built in close proximity to the mine during the 1870s. Robert M. Serjeant represented Ballarat West in 1859 as a member of the first Legislative Assembly. 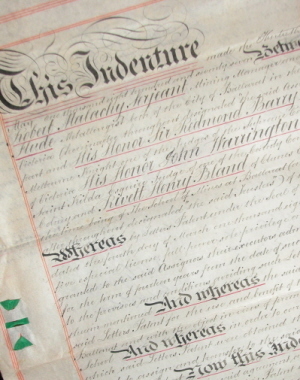 In 1860, the Ballarat Star reported: "The prominent characteristic of Mr Serjeant is industry. Possessing fewer natural advantages than most members, he has by untiring energy raised himself to an honourable position among his fellow Colonists, and has gained for himself an excellent character for zeal and honesty of purpose." In 1877 R.M. Sergeant, Joseph Flude and Henry Caselli donated the patent rights of a novel pyrites furnace to SMB. The furnace was the forerunner of the furnaces used at the Band and Albion Consols Mines, and later at Edward's famous pyrites works in the White Horse Ranges. The R.M. Serjeant Scholarship at SMB resulted after a reward was offered for the first to produce a marketable process for the treatment of complicated auriferous ores. A deadline was given, and if not met the money was to go towards a Scholarship in Mining in engineering at SMB. The Scholarship became a reality in 1889, but was first awarded in 1922. The first recipient was Reuben Russell who was entitled to a Mining and Metallurgy diploma course of three years duration and a small annual cash payment. Robert Malachy Serjeant died on 25 October 1902 at Ballarat, aged 74.